PageRank is a mathematical algorithm that was created to evaluate the quality and quantity of links that a webpage has pointing to it. This evaluation helps determine a relative score of the page’s importance and authority on a scale of 0–10. Each link from one page to another increases the page’s score. However, the weight of the score that a page receives depends on the scores of the pages that are linking to it. And those pages’ scores depend on the scores of the pages that are linking to them, and so on. If a page had a score of nine, and it links out to three pages, the theory is that each page would get one-third of its value. Meaning, they would each receive a score of 3 out of 10 from that single link. This scoring becomes a lot more complicated when you consider that the number of links each page has can change all the time, and this change impacts every other page down the line. There can also be an issue with valuing pages that have gained more than ten points. Page A has a single link pointed to it, but that link is from a page with a score of 10, and it’s the only one that the original page has linked to. Which means page A’s score is 10 out of 10. Page B has one hundred links pointed to it, all from pages with a score of 8, and they’ve all only linked out to two pages. Which means page B’s score is also 10 out of 10 (100 x 8/2 = 40, and the max score is 10). Should these two pages really have the same authority? Of course not. Which is why the formula is much more complex than it may first appear. In reality, Google has to use a lot of complicated math to translate all the possible scores into a simplified 0 to 10 rating scale. 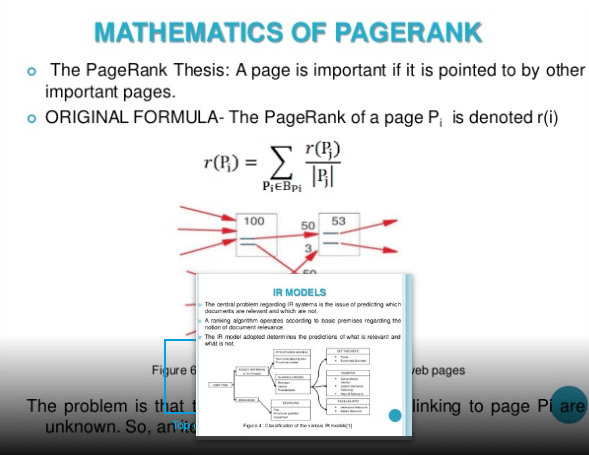 PageRank (PR) is a calculation that was invented by Google founders Larry Page and Sergey Brin. Initially, these scores were made public through the Google Toolbar, and they based them on the formula above. However, on April 15, 2016, Google officially shut down the Toolbar PageRank Data to the public. Which means that the ranking formula is now confidential. PageRank is meant to help Google return search results that are relevant, accurate, and trustworthy. If a page has a lot of credible sites linking to it, then it’s more likely to be a reputable page, containing valuable information. Which means that sites with a high PageRank are more likely to be shown on page one of Google. But, of course, this is not the only factor in rankings. A high PageRank doesn’t guarantee top rankings in Google, because PageRank is only one factor in the algorithm. It’s also important to understand that the value of the page linking to you is crucial. Just having more links is not enough. When it comes to links and PageRank, the key is quality over quantity. In fact, poor quality or spammy links can kill your search engine rankings as Google will penalize them. Fear of potential penalties has caused lots of site owners to not only stop link building but start link pruning instead. The best scenario would be to gain links from pages with a PageRank score of 10 out of 10. However, there are only a handful of domains with this score. These include USA.gov and Twitter.com. One reason for this is that they have the highest volume of inbound links of any sites on the web.